Lake Baikal (Russian: о́зеро Байка́л Ozero Baykal, pronounced [ˈozʲɪrə bʌjˈkɑl], Buryat: Байгал нуур Baygal nuur) sits in Southern Siberia in Russia, located between Irkutsk Oblast to the northwest and the Buryat Republic to the southeast, near the city of Irkutsk. Also known as the "Blue Eye of Siberia," it contains more water than all the North American Great Lakes combined. At 1,637 meters (5,371 ft), Lake Baikal constitutes the deepest lake in the world, and the largest freshwater lake in the world by volume, holding approximately 20 percent of the world's total surface fresh water. 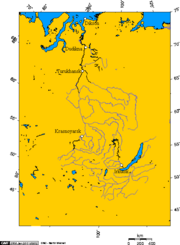 Like Lake Tanganyika, Lake Baikal formed in an ancient rift valley and therefore has a long, and crescent shape with a surface area (31,500 km²) less than half that of Lake Superior or Lake Victoria. 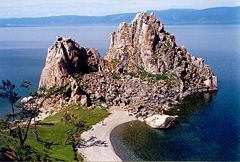 Baikal serves as home to more than 1,700 species of plants and animals, two thirds found only in the lake zone. UNESCO designated Lake Baikal a World Heritage Site in 1996. At more than 25 million years old, it has been declared the oldest lake in the world. The successful dive of Mir-1 and Mir-2 mini-submarines to the deepest place in Baikal on 29 July 2008, at over one mile, has opened the prospect of new discoveries of ancient lake life. The peninsula of Svyatoy Nos. While known as the "North Sea" in historical Chinese texts, Lake Baikal had been located in the then Xionu territory. Lake Baikal had been out of the public eye until the Russian government built the Trans-Siberian railway between 1896 and 1902. The scenic loop encircling Lake Baikal needed 200 bridges and 33 tunnels. As under construction, F.K. Drizhenko headed a hydrogeographical expedition that produced the first detailed atlas of the contours of Baikal's depths. The atlas demonstrated that Lake Baikal has more water than all of North America's Great Lakes combined—23,600 cubic kilometers (5,662.4 cu mi), about one fifth of the total fresh water on the earth. In surface area, the much shallower Great Lakes Superior, Huron and Michigan in North America, as well as by the relatively shallow Lake Victoria in East Africa exceeded it. Known as the "Galápagos of Russia," its age and isolation have produced some of the world's richest and most unusual freshwater fauna of exceptional value to evolutionary science. Lake Baikal lies in a rift valley created by the Baikal Rift Zone where the crust of the earth pulls apart. 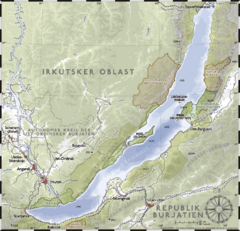 The Yenisei River basin, Lake Baikal, and the settlements of Dikson, Dudinka, Turukhansk, Krasnoyarsk, Irkutsk. At 636 kilometers (395.2 mi) long and 79 kilometers (49.1 mi) wide, Lake Baikal has the largest surface area of any freshwater lake in Asia (31,494 km²), constituting the deepest lake in the world (1,637 metres, previously measured at 1,620 metres). The bottom of the lake measures 1,285 metres below sea level, but below that lies some 7 kilometers (4.3 mi) of sediment, placing the rift floor some 8–9 kilometers (more than 5 miles) below the surface: the deepest continental rift on Earth. In geological terms, the rift, young and active, widens about two centimeters per year. The fault zone experiences frequent seismic activity. New hot springs appear in the area and notable earthquakes happen every few years. It drains into the Angara tributary of the Yenisei. Its age, estimated at 25–30 million years, makes it one of the most ancient lakes in geological history. Unique among large, high-latitude lakes, its sediments have been unscoured by overriding continental ice sheets. U.S/ and Russian studies of core sediment in the 1990s provide a detailed record of climatic variation over the past 250,000 years. Geologists expect longer and deeper sediment cores in the near future. 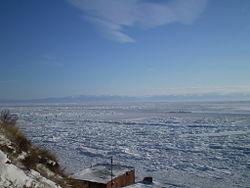 Lake Baikal has been confirmed as the only fresh water lake with direct and indirect evidence of gas hydrates existing. The lake is completely surrounded by mountains, with the Baikal Mountains on the north shore and the taiga technically protected as a national park. It contains 22 islands; the largest, Olkhon, measures 72 kilometers (44.7 mi) long. The lake has as many as three hundred and thirty inflowing rivers, the main ones draining directly into Baikal include the Selenga River, the Barguzin River, the Upper Angara River, the Turka River, the Sarma River and the Snezhnaya River. The Angara River serves as its single drainage outlet. Despite its great depth, the lake's waters have excellent oxygenation throughout the water column compared to the stratification that occurs in such bodies of water as Lake Tanganyika and the Black Sea. 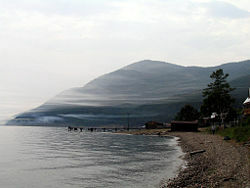 Olkhon, the largest island in Lake Baikal, constitutes the fourth-largest lake-bound island in the world. Omul Fish at the Listvyanka market. The extent of biodiversity present in Lake Baikal surpasses all except a few lakes. Lake Baikal hosts 1,085 species of plants and 1,550 species and varieties of animals, with over 80 percent of animals endemic. Epischura baikalensis, endemic to Lake Baikal, dominate zooplankton species; 80 to 90 percent of total biomass. The Baikal Seal or nerpa (Phoca sibirica), found throughout Lake Baikal, constitutes one of only three entirely freshwater seal species in the world, the other being the two subspecies of freshwater Ringed Seal. The omul (Coregonus autumnalis migratorius), a smallish endemic salmonid, may be the most important local species. 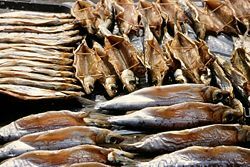 Local people catch and smoke the salmonid, selling it widely in markets around the lake. The two species of golomyanka or Baikal oil fish (Comephorus baicalensis and C. dybowskii) have earned special note. Those long-finned, translucent fish, living in depths of 700 to 1600 feet, serve as the primary prey for the Baikal seal, representing the largest fish biomass in the lake. The Baikal oil fish have become famous for disintegrating into a pool of oil and bones when withdrawn rapidly from the high pressures of the deep water. The Baikal grayling (Thymallus arcticus baicalensis), a fast swimming salmonid popular among anglers, and the Baikal sturgeon (Asipenser baerri baicalensis) both constitute important endemic species with commercial value. Hunters commonly track and shoot bear and deer along Baikal shores. Several organizations have been conducting natural research projects on Lake Baikal, mostly governmental or groups associated with governmental organizations. The Baikalian Research Centre, an independent research organization, conducts environmental educational and research project at Lake Baikal. On July 2008, Russia announced plans to send two small submersibles, Mir-1 and Mir-2, one mile to the bottom of Lake Baikal to conduct geological and biological tests into its unique ecosystem. Famous scientist and federal politician Artur Chilingarov had been announced to join the 60 dives. On July 29, 2008, Mir-1 and Mir-2 mini-submarines made the record dive to 1,680-meter (5,500-foot) at the lake's deepest point. The lake in the winter, as seen from the tourist resort of Listvyanka. The ice becomes thick enough to support pedestrians and snowmobiles. The lake in the summer, as seen from Bolshiye Koty on the southwest shore. Industrialists constructed the Baykalsk Pulp and Paper Mill (BPPM) in 1966 on the shore line. The BPPM bleaches its paper with chlorine, discharging the waste into Baikal. Despite numerous protests, the BPPM still operates. Environmental activists endeavor to make the pollution less harmful rather than end BPPM's production, since a plant shutdown would end jobs vital to the local economy. Russian oil pipelines state company Transneft planned to build a trunk pipeline that would have come within 800 meters (2,620 ft) of the lake shore in a zone of substantial seismic activity. Environmental activists in Russia, Greenpeace, Baikal pipeline opposition and local citizens strongly opposed to those plans. An accidental oil spill would cause significant damage to the environment the fragile lake environment. According to its president, Transneft held numerous meetings with citizens in towns along the route, especially in Irkutsk.Russian president Vladimir Putin intervened, ordering the company to consider an alternative route 40 kilometers (24.9 mi) to the north to avoid such ecological risks. Transneft agreed to alter its plans. Transneft has since decided to move the pipeline away from Lake Baikal so that it will bypass federal and republic nature reserves. Work began on the pipeline two days after President Putin agreed to changing the route away from Lake Baikal. In 2006, the Russian Government announced plans to build the world's first International Uranium Enrichment Center at an existing nuclear facility in Angarsk, 95 kilometers from the lake's shores. Critics argue that could lead to a disaster for the region, urging the Government to reconsider. After the uranium has been enriched, only ten percent of the radioactive material go to customers, leaving 90 percent in the Lake Baikal region for storage. Uranium tails, the leftover waste after the enrichment process, contain radioactive and toxic materials extremely dangerous to humans, potentially contaminating rivers and lakes. Investors from the tourist industry have been drawn to Lake Baikal since energy revenues sparked an economic boom. That represents an economic benefit to local residents but potential harm to the Lake Baikal site. Viktor Grigorov, owner of the Grand Baikal in Irkutsk, a city with a population of about 600.000, numbers among the investors who planned to build three hotels, creating 570 jobs. In 2007, the Russian government declared the Baikal region a special economic zone. The popular resort of Listvyanka has a seven-story Hotel Mayak. Rosatom plans to build a laboratory in Baikal, in conjunction with an international uranium plant and to invest $2.5bn in the region and create 2,000 jobs in the city of Angarsk. The harmful toll of hotels in the World Heritage site, Lake Baikal, looms as an environmental threat. ↑ 4.0 4.1 4.2 U.S. Geological Survey Fact Sheet: Lake Baikal—A Touchstone for Global Change and Rift Studies, July 1993. Retrieved July 23, 2008. ↑ "Russia." Britannica Student Encyclopedia. 2007. Encyclopædia Britannica Online. . Retrieved July 23, 2008. ↑ M.I. Kuzmin, et al., 1998. "First find of gas hydrates in sediments of Lake Baikal." Doklady Adademii Nauk 362: 541-543 (in Russian). ↑ M. Vanneste, et al., 2001. Multi-frequency seismic study of gas hydrate-bearing sediments in Lake Baikal, Siberia. Marine Geology 172: 1-21. ↑ P. Van Rensbergen, et al., 2002. Sub-lacustrine mud volcanoes and cold seeps caused by dissociation of gas hydrates in Lake Baikal. Geology 30(7): 631-634. ↑ Зоопланктон в экосистеме озера Байкал / О Байкале.ру - Байкал. Научно и популярно. Retrieved July 23, 2008. ↑ Russian mini-subs surface after record dive in Siberian lake.Novosti, July 29, 2008 (in English) Retrieved August 13, 2008. ↑ 23.0 23.1 23.2 Saving the Sacred Sea: Russian nuclear plant threatens ancient lake. New Internationalist, 411 (May 2008) Retrieved July 23, 2008. ↑ Tom Esslemont, BBC NEWS, 'Pearl of Siberia' draws investors. Retrieved July 23, 2008. Van Rensbergen, P., et al., 2002. Sub-lacustrine mud volcanoes and cold seeps caused by dissociation of gas hydrates in Lake Baikal. Geology 30(7): 631-634. Plants of the Lake Baikal West Coast in English and Russian (download a pdf-photoalbum and descriptions). This page was last modified on 20 June 2018, at 14:25.